Professional generator for making Colloidal Silver only, containing constant current pre-programmed electronic microcircuit controller. 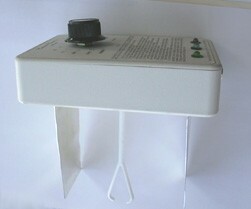 Includes motorized stirrer, alternating polarity Self-Cleaning. This single metal colloidal generator uses two electrodes of pure silver metal sheets. For best quality, we recommend large area electrodes of 2″ x 6″. This colloidal generator can make a 5 litre batch of 24 ppm in 24 hours, with the highest possible quality. To make it faster would overdrive the electrodes and result in large ineffective particles. All of our generators have automatic constant current control, self-cleaning alternating polarity, modulated broad spectrum high frequency pulses to ensure smallest particle size and water magnetization option for nanometre and angstrom sizes. All of our electrodes are 0.9999 (99.99%) pure precious solid sheet metal ( not jewelers grade). All of our generators for making Gold, Platinum, Titanium now use a higher voltage supply of 24 volts (UL, CSA, EU and Internationally approved). Contrary to some opinions, it is possible to obtain the highest quality Colloidal Gold using low voltage generators such as ours as shown by proven independent lab certification . Notes: The basic colloidal generator does not include electrodes, power adapter, magnetic stirrer. These options can be added according to your requirements.Our most common single channel silver configuration is shown above.The package selected is our most commonly chosen and can be easily changed as you wish.